For years I've wanted to play a good historical game. I would honestly probably rather play it than "I forgot how to squeeze a trigger so I'll bash you in the head with this nifty club" Hammer (okay, so it's not that bad, and I do enjoy 40k, but still...). Between my Masters program, kids, and moving to the UK I haven't had time to keep up with painting my 40k pieces. However, for Father's Day this year my wife graciously consented to get me a few Perry Crusader miniatures (possibly my most wanted minis of all time, as they are gorgeous). Since starting them I've decided to finish them out, and build myself a small to medium sized Norman/Crusader army. Along the way, I've discovered Gripping Beast/Studio Tomahawk's excellent Saga game. So I'm hoping to build something suitible for it and find some folks to play it with (my wife even says she might try it as it's so slimmed down for a war game, reading through the rules I can see how you could wrap it up in 45 minutes to an hour for games we'd play in the house, which is about her level). 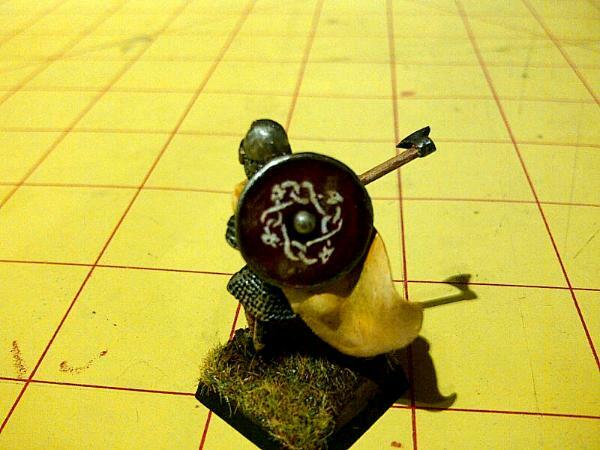 So, without further silly fluff, here is my Norman (and eventually Vikings for an opposing Saga warband) Blog. This is my first shot at something like this, but I've gotten on enough of a roll that I thought I'd give this a try. I'll look to showcase primarily my Normans and Vikings as I get them going and painted. 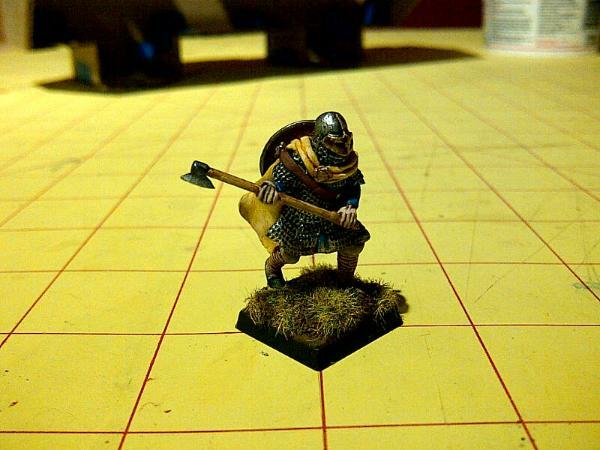 To begin with, I've built or painted stuff from Foundry, Gripping Beast, Artizan, and Perry. I have to say, Foundry is very nice but very expensive, Gripping Beast has had some okay minis and some total rubbish ones (and most of the ones I've bought from them have a lot of problems with globbed casting spots, that require a lot of time and effort to file down and work back into a proper shape), Artizan has had mostly good stuff, but sometimes I'm not super inspired by the style. Then there is Perry, which are gorgeous, fairly cheap in comparison, but horrific on the flash. Gad, I've never seen minis with so many mold lines on them. The sculpts are easily among the best on the market (possibly the only mini co I've found that can compare is Empress Miniatures for shear awesomeness of sculpt, but Empress doesn't do Normans, although they have had the least mold lines and flash of any mini from any company I've ever seen, seriously, if you are into modern combat, look up their US and British models, simply killer stuff). When I get a chance I'll try and show case what I mean, but here are some shots of the start of my army. These guys are a foot command unit. I am leaning towards running them as Stipendarii for Historical, and putting them in with Thrusting Spears, Light Armor, and Shields (I would go Dismounted Milites, but very expensive that way, and would have to skimp on the missile and foot troops then). These are possibly the second time I've experimented with weathering powders, and overall I'm happy with how that turned out. 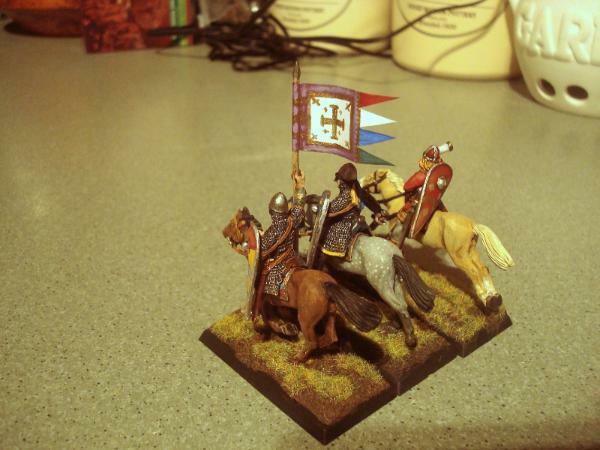 First of my mounted milites done. I was a bit inspired to deck him out in a similar fashion to a local town crier (not the same, but similar color schema, taking into account a bit of fading in his tunic's red). The shield is the town's coat of arms, or was at any rate. Which I felt appropriate as the town is recorded in the Domesday Book. I'm actually enjoying painting some of these horses. I've decided to really try and branch out a bit with design and style to capture some of the wide variety you can have with horses. I finished off another, and have gotten well into a few others. 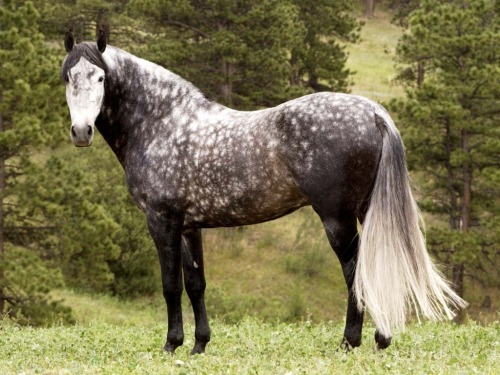 I'm really happy with my dapple grey horse. The lighting doesn't capture it as well as I'd like, but it may be one of my favorite horses. I plan to use this guy as either a champion or as a Comes for historical. The color scheme and badge is inspired by the Plantagenet family, notibly William Longespee, Earl of Salisbury. He was known to sport a blue surcoat and shield with a series of Lions Rampant on the shield. So I've elected for a single lion rampant on a blue field as an earlier ancestor of the Earl. For those who aren't familiar, William Longespee was one of the mightiest men in the realm of England and Normandy in his day. He helped found and build Salisbury Cathedral, his wife founded Lacock Abbey (parts of which were used in making the Harry Potter films. Not to mention it being a really nice day out as the village is lovely), and he was an illigitimate son of Henry the Second. So a fairly mighty guy in his time. His son was a famous crusader, who may be a key point for the origin of English/French animosity. Following with some WIP of some Milites and Stipendarii. The future Standard bearer is Perry, while the Whorl Cross Milite is Gripping Beat. On the whole the GB milite was of reasonable quality, though not nearily as finely detailed as the Perry Milite. However the horse doesn't look as good, I'm not sure what I'm going to do to tone down the bug eyes of the horse. Also, it may not be entirely evident, but I've been trying to get any 'free standing' legs to be unsupported and on the Perry minis at least I'm trying to carve out the metal between the reigns under the chin of the horse. Minor stuff, but I like the effect it gives. The Standard bearing milite does need to have one of his reigns fixed after an accident doing just that. I've decided to build the second musician to go with my champion above, and paint him as a retainer for the champion. The stipendarii with the brown stuff is a Gripping Beast Italo Norman. I found on these the right arms tended to be one big blob, and it wasn't positioned well for carrying anything. So I hacked it up and repositioned it. He will be carrying a spear when done. Cool! A historical blog! Great stuff. Enjoying the background you're giving us a lot. 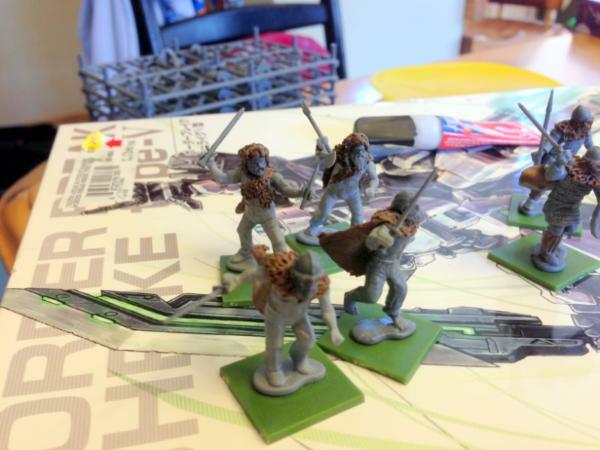 Have you seen any of Fireforge Game's plastic stuff? I dunno if it'd be useful for you, probably the wrong period I suppose, but I thought I'd point you at them in case any of it was up your alley. Interesting. It's nice to see some historical stuff in the P&M. Normans are looking good, and as a bonus you throw in a little history Look forward to when you start the vikings. I have seen their pieces online, and they do look firly nice. They aren't totally out of period, being formed between the First and Second Crusades, during that time arms and armor hadn't advanced incredibly (even by the 3rd crusade, you aren't totally beyond scope). Chain was becoming more full body over the more typical hauberks of the earlier Norman period and the first great helms started to appear by the 3rd crusade, but still similar shields and chain or chain and limited arm/leg plate (done in bands bolted to something usually, not the plate we usually think of). I do have 9 of Perry's Hospitalers that I will be painting as Templars in their white/black livery. The nice thing about Normans are the fact you can run them for battles in France, England, Italy, Byzantium, the Crusades, Ireland, or elsewhere. From being a group relocated to help buffer against Viking raids they moved on to control a pretty wide empire under various dukes, princes, counts, and even kings. The Normans in Italy conquered Sicily and large parts of Southern Italy, conquered England (okay, so they had Breton and Flemish help in spades, but still), actually challenged the might of Byzantium several times, and then played a key part in the success of the First Crusade, successfully carving out the first of the Crusader state. So, back again with an update. I've primed and done some basic flesh on my first group of Sargents (made the mistake of referring to them as Stipendarii, which is where we get the word stipend from, as they were hired soldiers, the Sargents being the non Milite mercenaries, which is what I will likely use them as). I've also primed up my sword wielding Milites. No photos of them though, not enough work gone into them yet. 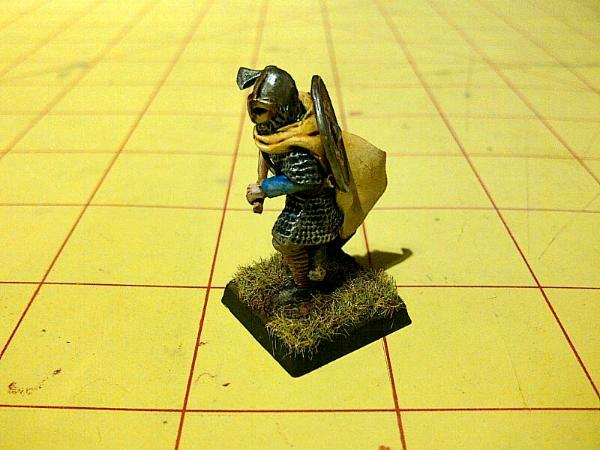 I do have WIP of a Milite Standard Bearer though. I've based his design on a German minestralis from a couple centuries later, Ulrich von Lichtenstein. He was a poet and a knight of the 1200s who wrote about how a knight should behave. I figured that was a good reason to base the man who will hold a 'papal standard' on. I will be doing the standard in gold, purple, and white, with various colored streamers at the end. Medieval Europe is a highly symbolic society as people could not read, by and large, so I will be choosing Red, Blue, Green and White for the for 'streamers' I will cut into the end (Normans being supremely religious each of those colors corresponds to a particular aspect associated with the Christian religion and it's primary focal point). The last photo here is not a great one, but shows where I'm going with the saddle and all. My Milite command is now done! Yay! I'm quite happy to be making the progress I am, given that I perhaps only paint for about 30 minutes or so at a time, and don't paint every day. Not the best lighting, but when you are painting at night, you take what you have. I'll try and get some better ones this week. 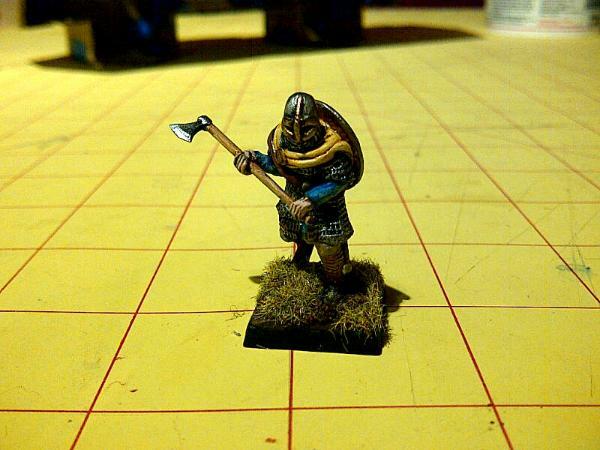 Okay, so not 28mm like my Normans, but here is a 54mm Viking Warrior I did about 2 years back to whet appetites for when I do get around to getting some of the 28mm done. He was actually a very early attempt with snow flock, so it didn't come out quite like I wanted, but the rest of the model turned out well. Nice job on the Milite, decent speed too. The viking is very cool, good job there Is that a sculpt from Pegasus? The horses are really striking, I think that's really important when making a cavalry army. The viking looks really good- the pose is great. Are you planning on any scenery? I've been daydreaming about a Celt army for a while, and the idea of making some raths and Crannógs is really appealing! I've managed to finish off two more milites. That makes 5 of 10 models I currently have, though I'll probably be happy to hit 8 and then work on a single warlord model for Saga. To go full out for a 1500 point Norman list I want a block of 11 and a block of 12, merging a Comes in with the block of 11. However, that will be a while yet. 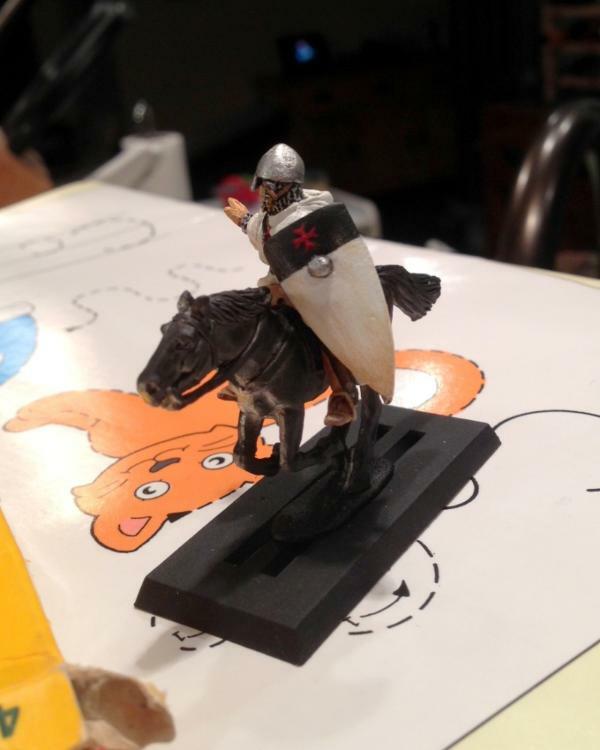 The model with the whorl cross is a Gripping Beast mini. You'll notice the figure and horse are 'chunkier' than the Perry mini. It isn't that they are bad, but the sculpt definitely isn't as nice as the Perry mini. The milite himself was actually caked with excess metal in the hand area that took a lot of cleaning, and on parts of the shield as well. I've been a bit busy of late. Having taken the family up to see Sherwood forest, and with other things. So I haven't gotten as much done as I would have hoped. Although part of that may be that I'm working on so many at once. 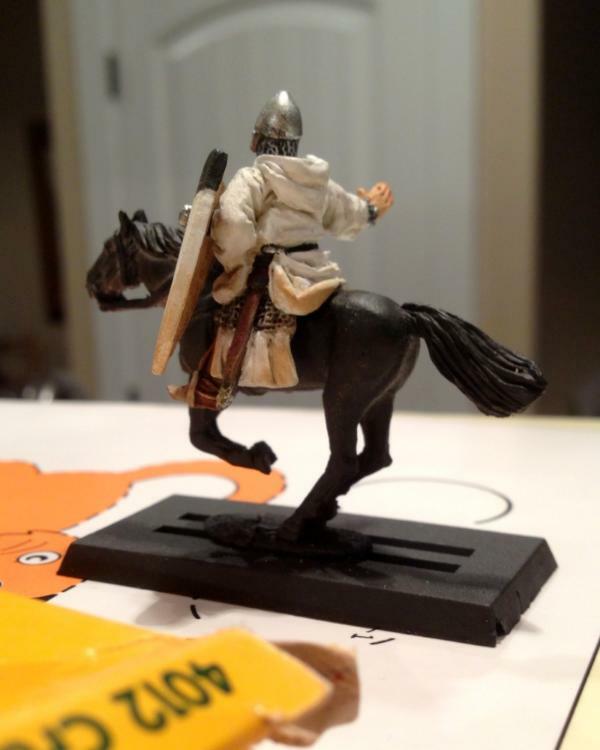 Here are some WIP shots of stuff to come, a few knights, some spearmen, and some vikings. Also I've included a recently finished knight based on the deRedvrs coat of arms. The deRedvrs were the lords of the Isle of Wight following the Norman conquest. Soon to be done Haggar the Horrible themed vikings (you can see there a random guy with the blond beard and then Haggar, Lucky Eddie, and Honi in progress, I didn't get Snert in the picture). Note, I don't want to make Haggar, but am painting to match the comics. Next on my Heathguard/Milite crew is a member of the Hungerford clan. The Hungerfords were a powerful family in Wiltshire whose history reads a bit like Dallas or Dynasty. Farleigh Hungerford castle often changed owners as the family went through various fortune shifts due to gambling problems or other debts. At one point the wife murdered and burned the lord of Hungerford in the castle kitchens. They are also one of the families who donated to Lacock Abbey (while going around the cloisters, you can find a boss of their coat of arms in an area that was previously bricked up under a medieval wall painting). I'll try and get some photos up of my market cross work in progress and another musician that I've recently finished. As promised, here is some of my wip terrain, and some more Sergeants/Warriors. 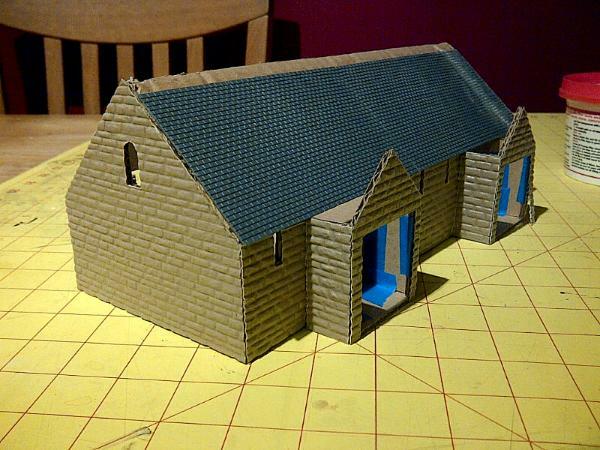 The terrain will be a covered market cross with a slate tile roof. The 'cobblestones' are made from cut up plasticard, and the shingles so far are made from thin cardboard/card stock, though I may be moving to a similar thickness plasticard as I am running out. I haven't quite decided how I want to do the cap on the roof yet, but I have a few good ideas. Now for the Sergeants that I've recently finished. From left to right they are de Vaux (some sources have a different color scheme, but this is the one I found depicted in a medieval manuscript, and I thought black and white would be a nice change, de Vaux as a family were donors for Lanercost priory. Today the Nave of the church is still the parish church, but the rest of the Abbey is owned by English Heritage. It is interesting because it is made from recycled bricks from Hadrian's wall. There are bits of tombs, part of a carving of Hercules, and other Roman bits in the walls. Two of the tombs may have belonged to Knights Templar, and show/depict the shell seen as a mark of those who had been to Jerusalem. Also in two of the window sills can be seen the faint traces of carvings of Nine Men's Morris and Fox and Hounds/Geese, that would have been used by the monks), a homage to the Wiltshire county flag (Wiltshire's flag is green and white with a red wyvern/dragon in the top left corner), the flutist is in the livery of the champion of the unit (blue and white with red trim), and the man on the end has no special significance. He was a part done model from years ago that I finished up and fit in. I plan to run these as Flemish Mercenaries in Saga (and have unified the unit a bit by everyone having some two of the following colors blue, white, and red). And a group shot with the standard bearer and champion previously posted. Here we have my first finished piece of terrain for my Normans and Vikings to fight over, a covered market cross. I haven't decided if I want to try and put "moss/mold" on the slate roof yet, for now I think I'll leave as is. Unfortunately the lighting isn't super (stupid time change in England making it dark when I get home from work now). 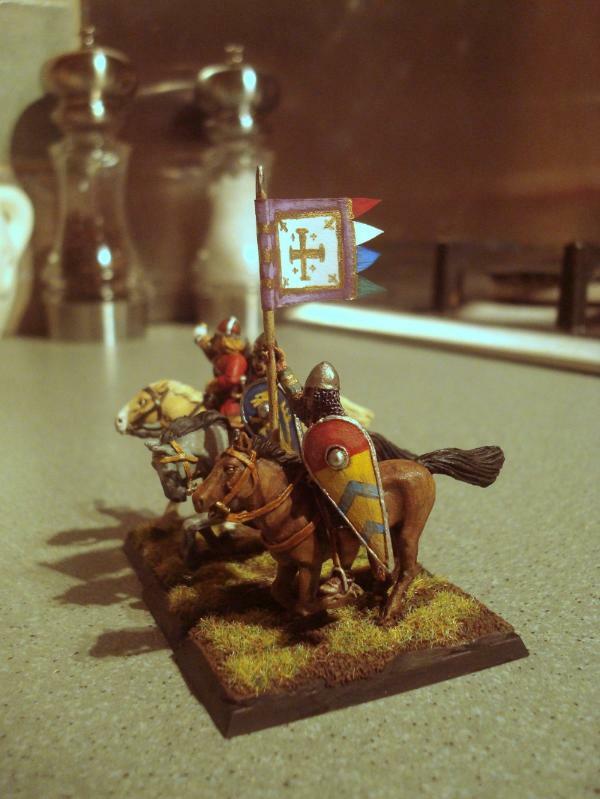 First I apologize as these are from my blackberry, but here is my first Viking (a converted Conquest Games Norman Infantry) and the start of my Tithe Barn. I reversed the direction of the axe on him, sculpted parts of the arms, one hand, his cloak, helm, shield strap, aventail, and a few minor other bits. 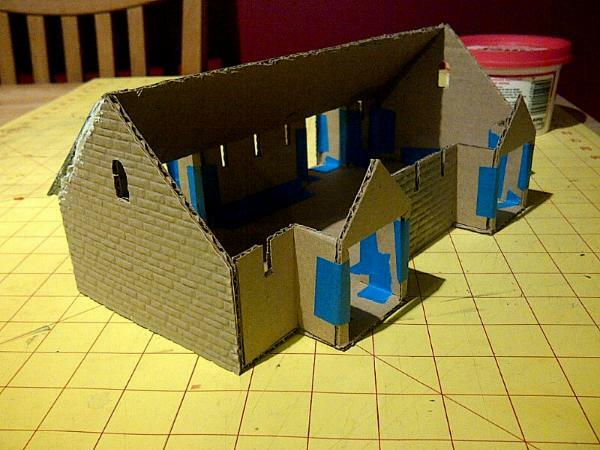 The Tithe Barn is being layered over with some pressed plasticard, and is modeled after the Tithe Barn in Bradford-Upon-Avon and the one in Lacock. Life has a way of coming up to slow you down. I haven't been doing a lot of painting of late, but have managed to finish my Tithe Barn and enough Norman Sergeants to make either a Norman Warriors or Flemish Mercenaries. My barn is inspired by the Cotswolds, and the lovely golden sandstone the buildings are made out of. 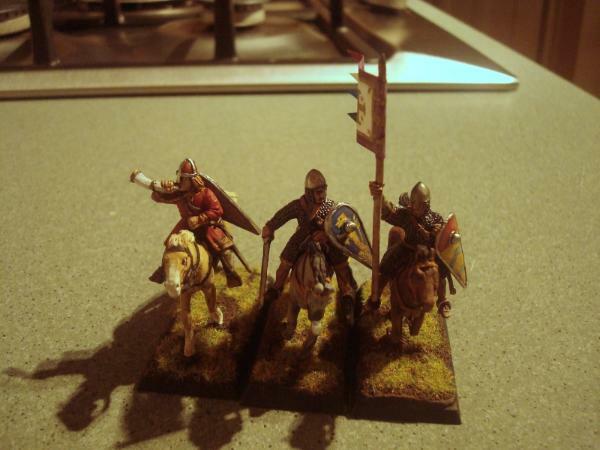 Then my Warriors/Flemish Mercenaries. I've added the Lutrell family (their actual crest has more birds, but this works. They were the lords of Dunster Castle in Exmoor national park, and donors at Lacock Abbey. Their fortunes waxed and waned over the years as they lost Dunster at one point and then recovered it. The red and white is based on a boss I saw on a sheet detailing various Wiltshire church bosses (I forget who the family was). 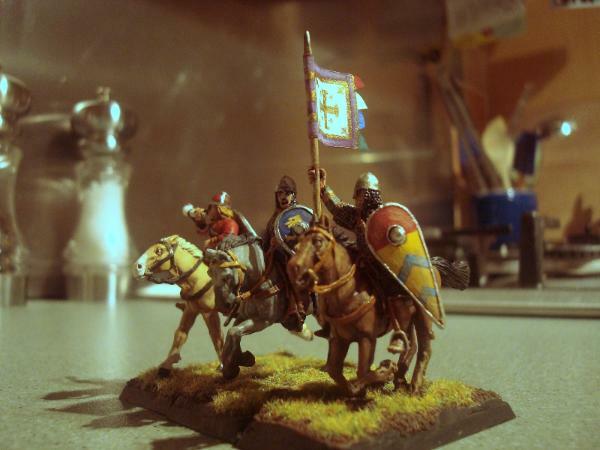 Here are my latest editions to my Normans. The first is the family shield/arms for the Meyners family which would become the Scottish Clan Menzie (which I can trace ancestry back to, which means at some point my family came out of Normandy. Which I only found out when looking up the Menzie coat of arms prior to the current one with the Saracen head. It was quite interesting to discover the clan is descended from a Norman knight who came over during the invasion by the name of 'Mayners/Meyners') and he's partnered with a Levy/Warrior customized to be similar to the statue of Robin Hood in Nottingham. Then we have deRoche, who was also a donor at Lacock Abbey. As with my others I'm trying to get red/white/blue onto all of the Sergeants as a unifying color theme. These are all looking great so far, love the horses. Very interesting and well written blog, congrats on the painting and character on each miniature shown !!! Really loving the way the shields came out ! I'm not dead yet! I'm sorry I haven't had an update in a long time, but we moved back to the US in January, and I haven't had any of my supplies or minis while we have been looking for a house. 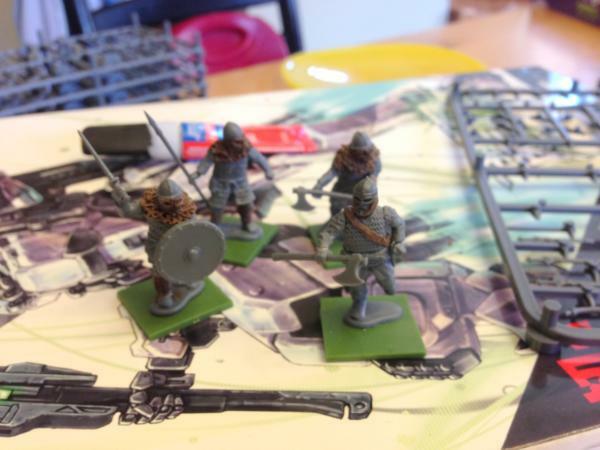 To keep working I purchased some wargames factory vikings and saxons to build out some vikings (and I've got enough I could build some Geats that can be used as vikings or anglo-danes or anglo saxons, given that Beowulf is an 'English' poem). Berserkers converted from the Viking and Ancient German sprues. You have to be a bit carful about what you use as the figures aren't to the same scale exactly. I've got a score of archers under construction as well, but not far enough along to share. Sculpting in tunics takes longer than I had originally thought. My it's been a while since I updated my blog. Moving, kids, etc has eaten up much of my time and I've allowed myself to slack off. At any rate, some more milites are in the works. The first uses the Fitzwalter coat of arms. Fitzwalter was involved in various places in Wiltshire, signed the Magna Carta, but is also Maid Marian's family according to Robin Hood Legends (Marian Fitzwalter). Given that my bowmen are going to be loosely based on Robin Hood I couldn't resist including a knight of the Fitzwalter household. Ultimately the heraldry for this knight is based on a clan with the same last name as my family name. I don't know that we're related, but I couldn't resist. I need to include a nice piebald horse for my next milite I think. I have a partly done milite based on a coat of arms from Muchelney Abbey and I haven't started on his horse yet. I think a nice piebald will do for him. I've started on my Templars, and have finished up my first rider, the squad leader. I've tried something a little different for painting the white. I've tried to make it feel like a lived in robe for a warrior monk, not something nice and pristine. Once my camera is charged up I will have to get some better pictures, as I've also done the skin a little different to try and capture a sun tan of some sort. Well, I haven't been getting a whole lot done for quite a while, as you can see. 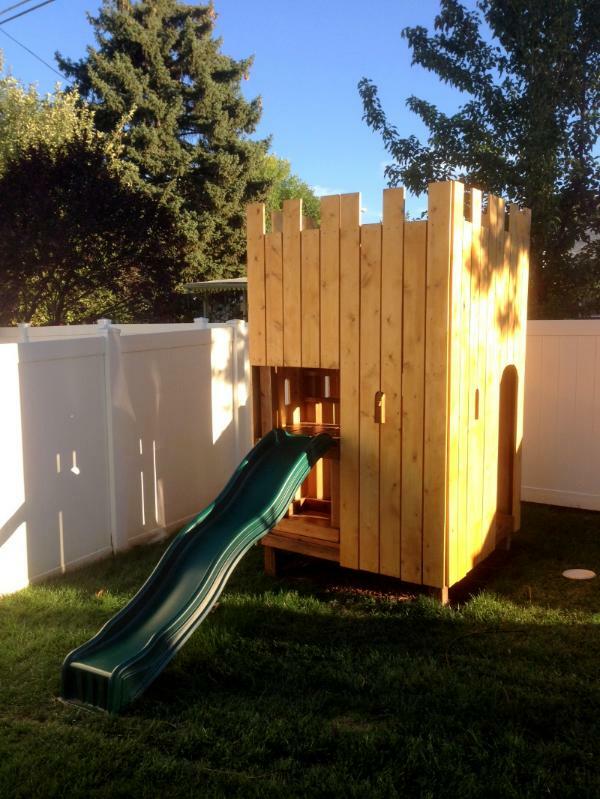 Here is the main reason for that, my kid's fort which I just 'finished' today. I'm pretty pleased with myself as I designed it all by myself, and mostly built it by myself (my Dad helped with the framing, and my wife helped hold board on the exterior, but otherwise made with my own two hands). It's a 'tri' level affair. The main floor, then a landing for the slide, and then a top floor that you can see my son standing behind it's railing in one of the photos. The swords and shield are from our 2 years in the UK. Forward thinking made me buy two instead of just one (my son was like 1 month old when I bought them, he's now 18 months). I will sand down the outside and stain it again, and I do have to add on the telescope on the top floor for them, but it's effectively done! Yay! Okay, so not minis, but Norman themed and thus related to the blog (particularly as my main time eater for the last two months, hey, I was traveling a lot...). I found out I was supposed to help run my daughter's preschool Halloween party just over two weeks before it was supposed to happen. Thankfully my Mother shares a passion for history and some very good sowing talents. We pieced the following costume together from bits I already owned (belt, dagger, slippers, brooch, and sundry) and I went as a Norman circa the conquest, or alternatively as a Viking if you prefer. The dagger, and I should post a photo of it, was hand forged by a blacksmith in England using iron from the 1800s and four thousand year old bog oak for the handle. It was my piece of history I took home from England with us. My wife was very good to me for Christmas with it last year (I had been looking for a pattern welded seax, but choose the dagger as something more personal and not just a modern recreation but also something containing actual history). The slippers aren't authentic to be sure, but were close enough. The cloak is done in the 'blanket' style, and we tried to pick only colors that you could have conceivably found, using rough linen. It won most unique costume at my work's Halloween shindig. Fascinated by the idea of Hadrian's Wall bits turning up in Wiltshire reuse of Roman stonework is pretty common but the trek down from Cumbria to Wiltshire especially during the Scourging of the North is weird. Your terrain is absolutely beautiful. Sorry for the confusion, Lanercost is near Carlisle. I spent a night there before we moved to England and then toured it again with my wife and my daughter the following summer. I just happened across the coat of arms while painting and had to put it in as the graves of two Templars were located at the end of the ruined part of the priory. 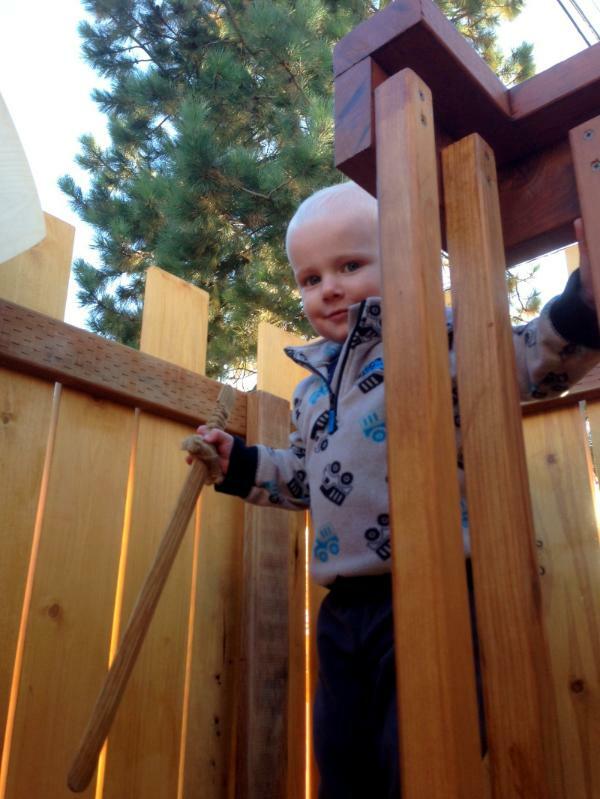 Hey, this blog! Just spotted it again. Great to see you're keeping on with it. I'm starting my own Norman force and intend basing it on the Normans in my own home area of Wexford in Ireland. You mentioned scale differences between the WGF germans and Vikings. I have the vikings and am planning on picking up the Germans at some stage, what are the differences in scale?